The Stairmaster trail is located along the Colorado River just west of Moab, Utah. 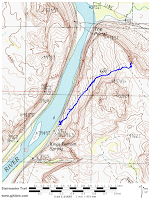 The trail climbs the hillside of the south side of the portal parallel to the Moab Rim trail. While the Moab Rim trail is open to all forms of travel including mountain bikes, ATV's and jeeps the Stairmaster is a hiking only trail. The trail is only a mile long but with an elevation gain of 1,089 feet (if you go all the way to the overlook) it has an average grade of 19% which provides for a good workout. The views of Moab and the surrounding area make it a much better alternative to being on a stair climber at the gym. 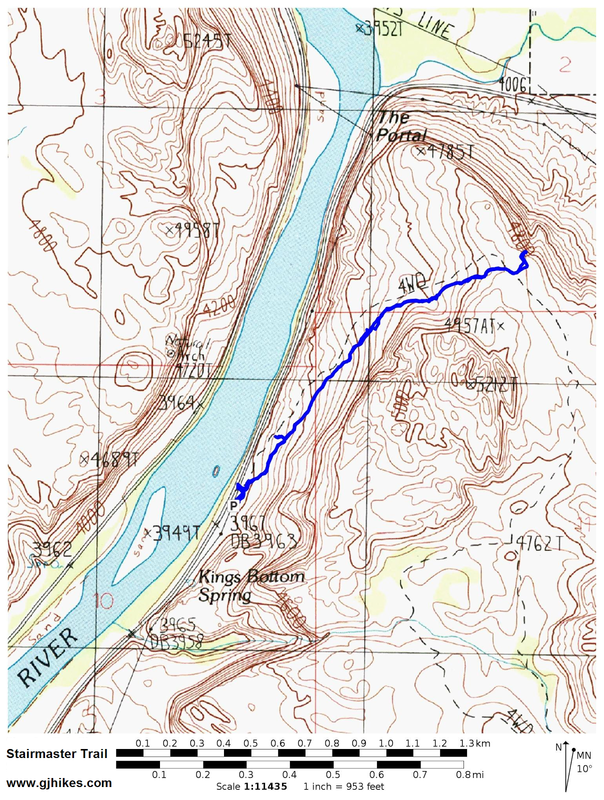 To get to the trailhead follow the Kane Creek Boulevard west for 2.7 miles from its intersection with Highway 191. This is the corner along the south end of Moab's main drag where there are currently a Burger King and McDonalds on either corner. As you depart from the Moab Rim trailhead watch for a marker along the right side for the Stairmaster trail. The trail isn't as well marked as it could be but it gets enough use that it isn't too hard to pick out the correct path. There are a few sections of the trail that are definitely stair like. Most of it is a steady uphill grunt over broken slickrock mixed with stretches of red dirt. 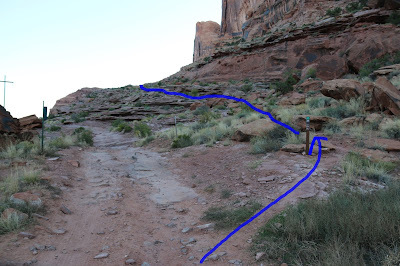 Around the 1 mile point the trail comes to an end where it reconnects with the Moab Rim trail. Before heading back down the hill a short stroll over to the rim will provide expansive views of Moab Valley. Off in the distance you can see into Arches National Park for a view that most park visitors can't even see. The scenery hiking back down the trail is a stunning look at the Colorado River plying its way toward Canyonlands National Park, Lake Powell and all parts beyond. If you look high up on the cliff on the opposite side of the Colorado River you can see Little Arch. The arch is visible for the first half mile of the trail or so but the best view is probably right from the Moab Rim trailhead. From that angle you can see a little bit of blue sky through the opening. With its close proximity to Moab the Stairmaster trail is a popular option with some of the locals who will get up early during the hotter months and hike up the trail often returning to the trailhead before the sun ever rises. That's not a bad way to start any day. If you prefer you can make a little loop hike by combining the Stairmaster and Moab Rim trails by hiking up one and then down the other. If you would like to see it for yourself then all you have to do is 'Take a hike'.